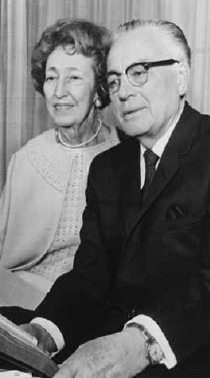 Freda Joan Jensen Lee was the wife of Harold B. Lee, former president of The Church of Jesus Christ of Latter-day Saints. She was born on July 2, 1897, in Provo, Utah. She earned a degree in education from Brigham Young University. She later did graduate work at the University of Utah, the University of California, and Columbia University. Freda was a well-known educator and had worked as a teacher, administrator, and officer in various education organizations. She cared for a foster daughter, Geniel. She married Harold B. Lee on June 17, 1963, several months after his first wife died. Freda had met him forty years before—she had been the girlfriend of one of his former mission companions. She had also known Elder Lee’s first wife, Fern. Freda had remained unmarried until her marriage to Elder Lee. She often worked with and spoke to youth groups. She was named Woman of the Year by the Associated Women Students of Ricks College in 1971 and by the Utah Women’s Review in 1972. She was a member of the Primary General Board, the YWMIA General Board, the General Church Music Committee, and the Sunday School Boards of the Jordan and East Jordan Stakes. She accompanied President Lee to various locations worldwide as he served as a general authority and then president of the Church. He died in 1973. Freda had been convalescing at home after being hospitalized for a broken hip. She died on the eve of her 84th birthday. This page was last edited on 1 February 2017, at 13:58.